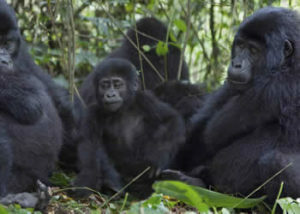 Join a 5 Days Rwanda Safari to trek mountain gorillas in Volcanoes national park and Chimpanzee Trekking Tour/canopy wlak in Nyungwe forest national park with Gorilla Trek Africa. 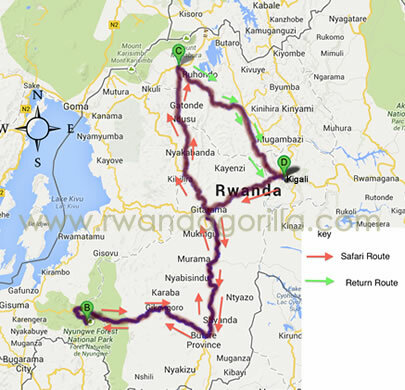 In the morning, you will enjoy a scenic long drive to Volcanoes national park in Ruhengeri. Dinner and overnight Mountain Gorillas view Hotel/ 5 Volcanoes Lodge (Luxury)/ Da Vinci Lodge, Gorilla Solution Lodge, Le bamboo Lodge (Deluxe)/Muhabura Hotel (Budget) as you prepare for the following day’s memorable adventure. After the briefing from the senior park ranger commence your memorable gorilla trekking adventure which normally takes 1 to 8 hours in the jungle. You will be allowed to stay in the presence of the gorillas for at least an hour. After the gorilla trek, your safari guide will transfer you back to the lodge for relaxation and any other next activity. Dinner and overnight at Mountain Gorillas view Hotel/ 5 Volcanoes Lodge (Luxury)/ Da Vinci Lodge, Gorilla Solution Lodge, Le bamboo Lodge (Deluxe)/Muhabura Hotel (Budget). 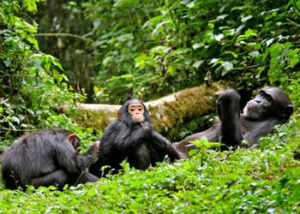 Gorilla Trek Africa makes sure all our clients stay at the most relaxed during a safari with us, in clean and highly rated safari establishment in the different destinations Uganda, Rwanda, Kenya, Tanzania, Burundi and DR Congo. Our preferred high end hotels in Kigali are Serena Kigali Hotel, Gorillas Golf Hotel, and Mille Collines Hotel, In the mid-range category, we have The Garr hotel and Lemigo Hotel.